"I wanted to take camouflage out of its normal context and really look at it in a more graphic way, as more of a motif. There are hundreds of different camouflages, so we selected ones very carefully that looked quite different to the way we normally think of the patterning. We had one that is more like a horn motif, one that is quite floral, one that felt like an animal print. 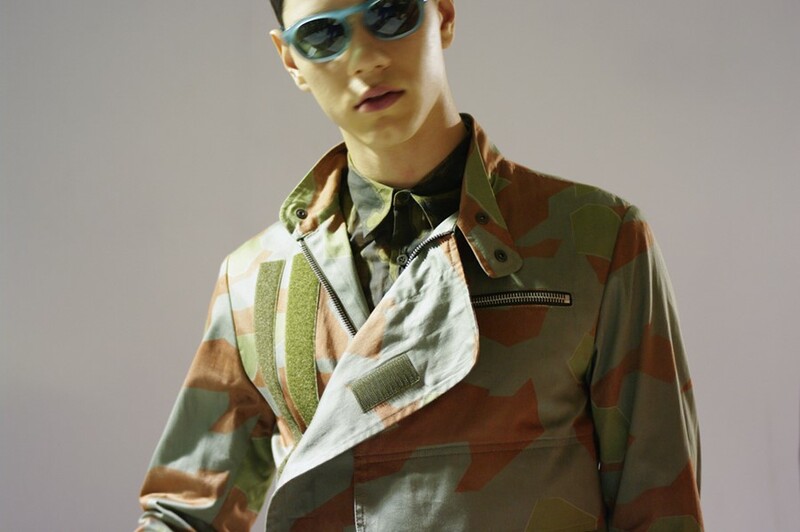 We chose all of these various elements to create a different take on the way we understand camouflage in fashion today. I juxtaposed this against the Chantilly lace and other elegant materials to again give it a different twist. Most people see camo in terms of the army and an urban aesthetic but there are so many different motifs that flow through the pattern and at the time they were created actually quite spontaneously. It is that aspect that I was really drawn to, it is fantastic to think of the impact they have had and the way they were originally designed. The jackets were then about deconstruction and I used a lot of elements from fencing, just to bring in that sportier feel and to give a more casual feel. In the end, it is menswear so it's not appropriate to only have suits on the runway. I also worked in the brass detailing, which was in fact also the material that made up the invite for the show. I wanted it to be half way between something a jeweller would create and also again, something military. Also for me the music replicated the way I was playing with clichés, I took well known pop tracks and then had them deconstructed so that in the end they sounded more like Steve Reich."